In the previous episode of this series about how to develop a Windows Phone application from scratch we found out that special care must be taken when data must be passed between an application and its PeriodicTask. You learned how data can be protected against mutual access by using a Mutex object. You also learned that you cannot pass data directly from one to another, because the application and its PeriodicTask execute inside different processes. In this episode of EvenTiles you will learn how you can make use of IsolatedStorage to pass data from the application to the PeriodicTask. Since we already created a separate project in the EvenTiles solution that is taking care of passing data, we can simply modify functionality in that project (EvenTilesComm) to use a file to pass data between the application and its PeriodicTask. Data protection against mutual access is already in place, so we can concentrate on file access. Hopefully the design decision in part 13 to make use of private methods that are called each time we access a public property inside the TileData class starts to make sense now. In order to pass data between the application and the PeriodicTask we will extend the private retrieve / store methods inside the TileData class by adding a call to a couple of other private methods. Those new private methods will use a file in IsolatedStorage to read / write data from, meaning we can effectively pass data between the application and its PeriodicTask. A new string to be displayed on the back side of a Secondary Tile will be stored by the application each time users modify their own tile text in the Settings Page of the EvenTiles application (something that will also be done initially when the application starts). The PeriodicTask simply retrieves that data (since now the data is persisted in a file this will work properly) and displays it on the back side of the Secondary Tile. Each time data needs to be stored a new file is created in IsolatedStorage or an existing file is overwritten. Each time data needs to be retrieved, we check if a file containing that data exists. There are small ways to optimize data access in the TileData class, because right now we simply read / write all file content when retrieving / storing single property values. However, this approach simplifies the code and the overhead with only two different variables is very small. The following video shows EvenTiles in action with proper transfer of data between the application and its PeriodicTask. To be able to experiment with this working implementation of EvenTiles, especially to understand how the application interacts with the PeriodicTask through a file in IsolatedStorage, the sample code is available for dowload here. EvenTiles will continue soon so stay tuned for the next episode. In the previous episode of this series about how to develop a Windows Phone application from scratch we fixed some issues to properly start and renew a PeriodicTask. Now we are ready to find out how an application can communicate with its PeriodicTask. In today’s EvenTiles episode, you will learn why you cannot simply use a variable to communicate between the application and the PeriodicTask. In my opinion that is important, because understanding why some things are not working makes you a better Windows Phone developer and decreases the chance of having hard to trace bugs inside your own applications. In order to separate the functionality to transfer data between the application and its PeriodicTask, we are going to create a new project inside the EvenTiles solution. The project will be of type Windows Phone Class Library and we will call it EvenTilesComm. In its initial version, this class library will contain one single class with the name TileData. It is used to store the text that the user can enter in the Settings Page of the EvenTiles application in order to allow the PeriodicTask to display this string on the back of the Secondary Tile once it is created. In order to vary the text on the back of the Secondary Tile, TileData will also contain a boolean variable indicating which string needs to be displayed on the Secondary Tile’s backside (either the string passed by the application or a default string that is defined inside the PeriodicTask). To be able to access TileData from within both the EvenTiles application and the PeriodicTask, it contains two static properties. A string property to store / retrieve the message that is defined through the Settings Page and a boolean property that defines which string needs to be displayed from within the PeriodicTask. The string property is always written by the application and read by the PeriodicTask. The boolean variable is both written by the application and the PeriodicTask but only read by the PeriodicTask. Because of the fact that the PeriodicTask and the application are running inside their own, separate process in different threads, and since they are running completely unsynchronized from each other, there is a possibility that they both want to access one of the properties of TileData at the same time. To prevent this potential dangerous situation (dangerous because it can leave the properties in an undefined state when one of the two different threads want to access them while the other is updating them), both properties are protected by a Mutex synchronization object. NOTE: The following (initial) implementation of the TileData class will not work properly, but it is shown here to help you understand what it means that an application and its PeriodicTask belong to each other, but are completely separated from each other at the same time. You will have to wait a little while for a working solution, because that will be introduced in the next episode of EvenTiles. If you look at the source code of the TileData class, you can see that we are using a two properties through which we are calling a few private methods to actually store or retrieve data. You will also see that we define a single Mutex inside the TileData class. This Mutex has a name, meaning it can be used to synchronize threads over multiple processes. This is important, since EvenTiles and its PeriodicTask will execute in separate processes. If we take a look at one of the individual retrieval methods, you will see how the single Mutex that is defined in TileData is used. 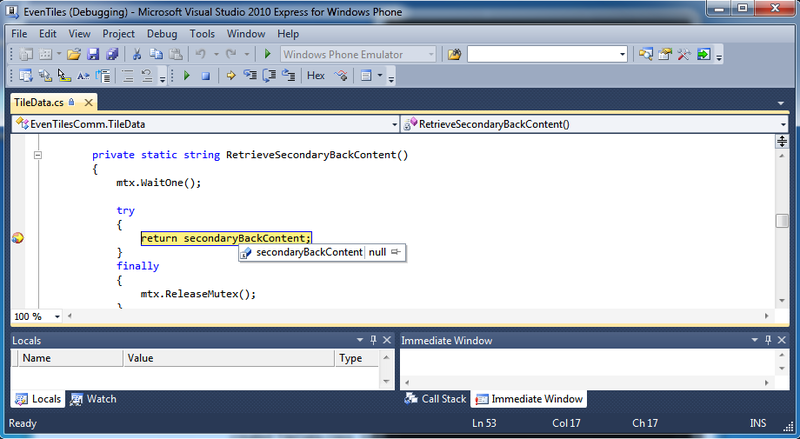 In this method, we access the variable secondaryBackContent only when the method WaitOne on our Mutex returns. When WaitOne returns, our method has exclusive access to the variable secondaryBackContent until we call the method ReleaseMutex on our Mutex. At that moment, another thread that is waiting for the same Mutex will be granted access. Every method that uses of a Mutex to get access to protected data must under all circumstances call ReleaseMutex when it is done. That is the reason why we are adding a try / finally block. The code in the finally block will execute, even when exceptions are thrown. In this way, we prevent our application from a potential deadlock situations (where multiple threads are waiting on each other to free up a synchronization object that is never being freed). The way data is protected for EvenTiles works properly, which can be verified by debugging the application and deliberately skipping a call to ReleaseMutex from within the EvenTiles application (which is fully explained in the accompanying video as well). Doing so will result in the PeriodicTask waiting forever for the Mutex, because it will never be released by the application. This at least proves that both EvenTiles and its PeriodicTask are making use of the same Mutex that they both need to own before being able to access variables. There is still a potential problem, because we are calling the WaitOne method without parameters, which means that we will wait indefinitely until the Mutex becomes available. In our simple example this is sufficient, but in a real application you most likely want to wait for a specific time and take action upon timeouts. However, there is a way bigger problem with the current implementation of our newly created TileData class. We already saw that the Mutex is properly shared between EvenTiles and its PeriodicTask, but what about the public properties. The following screen dump shows you what is wrong with the TileData class right now. Even though the variable secondaryBackContent is set by the EvenTiles application, it seems that it is not initialized when the PeriodicTask retrieves the variable (both through the appropriate properties). Since our EvenTiles application and its PeriodicTask are running in separate processes, they are completely separated from each other, meaning that they get their own copies of variables they both want to access, even though these variables are defined in a separate project. This is a good thing (even though we have to solve the problem), because otherwise all variables used by every process on the phone would need a unique name. The following video shows EvenTiles in action in combination with its PeriodicTask. It shows how the Mutex works and how passing data fails. To be able to experiment with this wrong implementation of EvenTiles, especially to understand how the application interacts with the PeriodicTask, the sample code is available for dowload here. Instead of using ‘simple’ variables to pass data between EvenTiles and its PeriodicTask, we will have to make use of IsolatedStorage and have them share data through a file. That will be the topic of the next episode of EvenTiles. In the previous episode of this series about how to develop a Windows Phone application from scratch we started talking about using a PeriodicTask to perform background processing for our application. 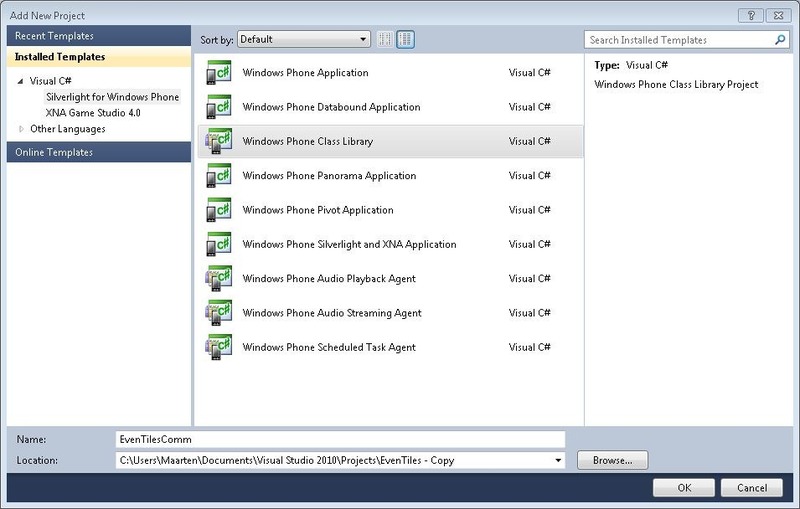 You learned how to create a Windows Phone Scheduled Task Agent, a separate project that became part of the EvenTiles solution to host a PeriodicTask. You also learned how the PeriodicTask relates to the EvenTiles to enable background processing for the application. In this episode of EvenTiles we will take a look at how to debug the PeriodicTask. When you have added a PeriodicTask to your application you may have noticed that the behavior of Visual Studio’s debugger did change. Instead of detaching the debugger if you terminate the application, the debugger remains attached. This allows you to debug the PeriodicTask when the application is no longer executing. This is of course important because typically the PeriodicTask executes without our application being active. Under normal circumstances, a PeriodicTask will run once every 30 minutes for a few seconds. This schedule can not be changed for released applications and is determined by the operating system. Of course debugging a PeriodicTask would be unproductive in this way. Therefore there is a possibility to run your PeriodicTask more frequent under test. 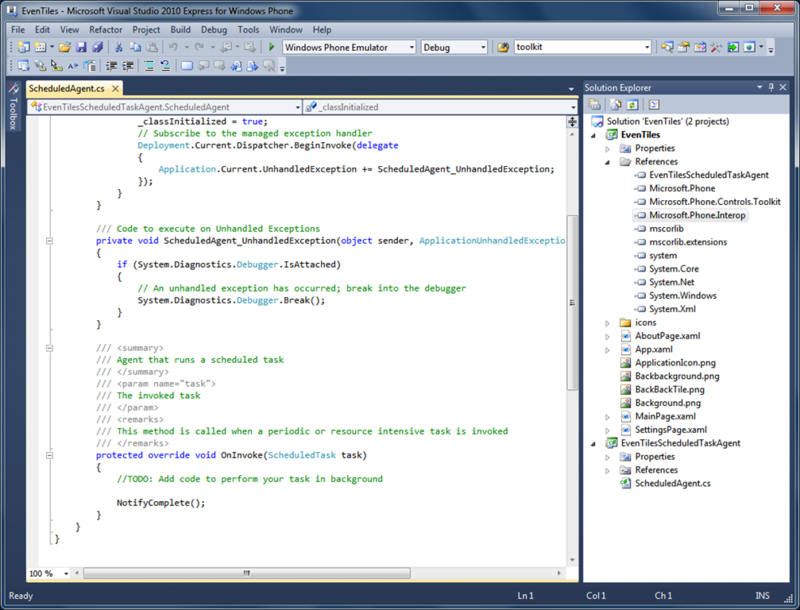 Debugging a Windows Phone Application’s PeriodicTask using LaunchForTest. Of course the functionality of the Periodic Agent is still to be determined. In part 12 of EvenTiles we will work on adding functionality for the Periodic Agent. In the previous episode of this series about how to develop a Windows Phone application from scratch we talked about creating a Secondary Tile programmatically inside our application and showing different content on both the front and the back of the Secondary Tile. 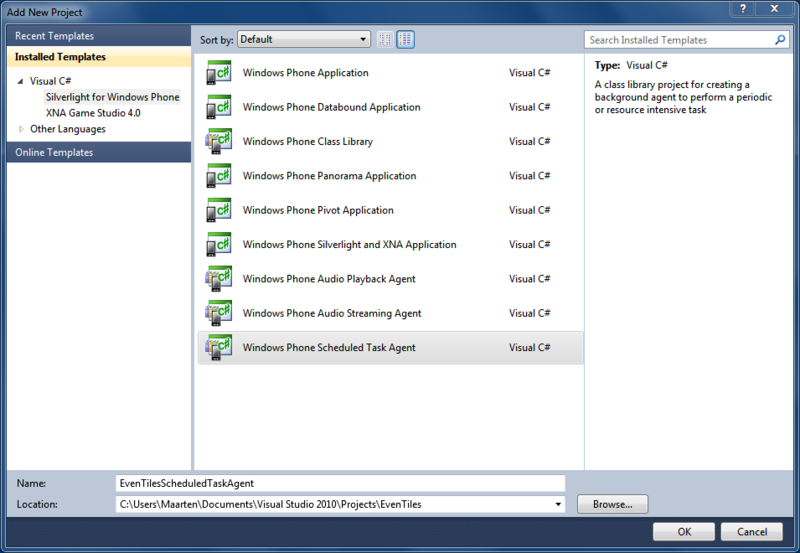 This time we will introduce the concept of Background Agents for Windows Phone. A Background Agent is a piece of application code that can execute, even when the application is not running. Background Agents can be used to periodically perform some actions. Depending on the type of action and the type of scheduling, Background Agents can be of type PeriodicTask (which runs regularly for short amounts of time) or of type ResourceIntensiveTask (which runs for a longer amount of time, but not on a regular interval). Each application can have at most one PeriodicTask and one ResourceIntensiveTask. There are restrictions in using both PeriodicTask and ResourceIntensiveTask. One of the more important things to keep in mind is that a PeriodicTask will run approximately every 30 minutes for at most a couple of seconds, and it will continue running roughly twice an hour for 14 days in a row (assuming the PeriodicTask does not crash). If the application has not renewed the PeriodicTask within those 14 days, the PeriodicTask will be removed from the schedule. Thinking about it, that makes sense. If a user is not using your application for such a long time, it is probably not necessary to continue executing code for that application in the background. For EvenTiles we will make use of a PeriodicTask, to allow updating of our Secondary Tile on a regular interval. Since updating the Secondary Tile is a relatively simple action, this is a perfect candidate for a PeriodicTask. 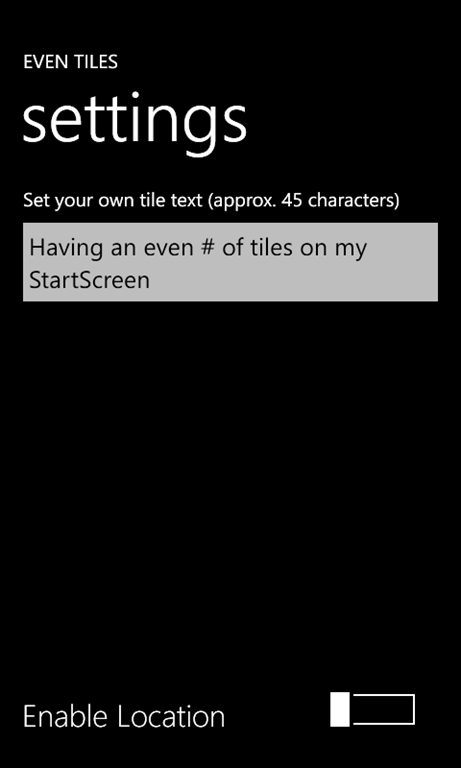 In this way we can bring our Secondary Tile to life (after all, things will change to it on the start screen of the user’s phone), regardless of the execution state of our application. This technique can for instance be used to update weather information, or number of newly available emails to simply keep the user informed. In our sample application, we will use a PeriodicTask to simply display different strings on the back of the Secondary Tile. The reason to chose something so simple is to be able to concentrate on the bare functionality of the PeriodicTask, its relation to the application and ways to exchange data between the application and its Periodic Task. In the newly created PeriodicTask you will find a method called OnInvoke. That is the method into which you will add the functionality you like to have executed in the background. It is important to call the NotifyComplete method as last statement inside your OnInvoke method. Each time your code executes, it will execute in a separate thread. Since the PeriodicTask runs independent from the application (once the application has started the PeriodicTask), it can not update the User Interface of the application it belongs to. Calling the methods to create / remove our PeriodicTask from inside our Click event handler is of course a simple action, although you should note that we create the PeriodicTask before creating a Secondary Tile. The reason for that is to allow the PeriodicTask to display a MessageBox to the user in case of problems. By first creating the Secondary Tile we force our application to immediately go to the background, and with that, not being able to show the MessageBox to the user. One thing is annoying in our solution so far. If we want to debug our PeriodicTask, we would have to wait 30 minutes each time until code in the PeriodicTask will be executed. How to overcome this problem will be topic of part 11 of our ongoing series around EvenTiles.